January 2012: Examines technology trends on which facility operators can capitalize to attract more customers and make more money. February 2012: Offers articles on revenue‑generating services and products guaranteed to increase self-storage operators' profit. March 2012: This issue examines the steps managers and owners can take to use their time more efficiently and improve the overall look and operation of their business. April 2012: Examines key investment opportunities, steps to increase facility value, loan options and investment quality. May 2012: Highlights the many ways operators are embracing new technology, including adding kiosks, new features in management software and partnering with call centers. June 2012: Highlights trends in facility design, adding curb appeal, and building successful ancillary areas, such as wine storage, records storage, boat/RV storage and retail. July 2012: Discusses important issues relating to business protection, from legal issues and facility crime to safety and insurance. August 2012: Contains the annual Buyer’s Guide, a comprehensive directory comprising hundreds of industry product and service suppliers. September 2012: Offers advice on self-storage construction and development, including site selection and design, the rezoning process, conversions, multi-story building and more. October 2012: Contains the annual Top-Operators List and addresses facility ownership essentials including budgeting, expenses, auditing, tax issues, estate planning and more. November 2012: Includes access to a special report: “Choosing, Using and Maximizing Third-Party Services," and editorials from winners of this year’s ISS Best of Business campaign. 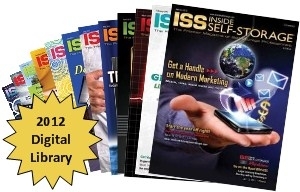 December 2012: Features articles to help self-storage owners make the best possible manager hires and keep staff motivated and engaged, as well as insightful editorials from this year’s ISS Best of Business campaign.